Santa Rita - Ancient Chetumal - "Our Belize Vacation"
The Maya site located at Santa Rita is thought to be the ancient city of Chetumal. During the late Postclassic period, (from AD 1200 to AD 1500), ancient Chetumal was part of a group of Maya principalities known as the "League of Mayapan". The group was ruled by the powerful family known as Cocom, who resided in the capital city of Mayapan (known today as the Yucatan in Mexican). The ruler of Santa Rita/Chetumal was a warlord known as Nachancan. The location of Santa Rita (or ancient Chetumal) was important, because it was situated on a trade route that ran along the length of the Caribbean coast. Proximity to local rivers also allowed access into the interior of Mexico, Belize and Guatemala to Maya centres such as Lamanai and other cities in the Peten. Santa Rita was well known for its production of high quality cacao, marine products, achiote, honey and vanilla. All exported to Maya neighbors in northwestern Belize, the Peten and Northern Yucatan regions. During the Spanish conquest, Santa Rita's convenient trade location attracted the Conquistadores - who attempted to take the city by force, to establish their base there. Historical records note that a Lieutenant Alonso Davila, with 50 men and 13 horses (in 1531), took control of Santa Rita or Ancient Chetumal. Upon their arrival, Spaniards expecting a fight, found the town completely abandoned. Davila quickly established his base in Chetumal and renamed the community Villa Real. 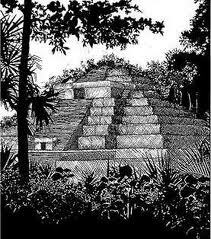 The abandonment of Chetumal by the Maya people however, was all part of a well-thought out plan, to eventually take back the city from Davila. The Maya chieftain Nachancan, of ancient Chetmual had an unusual son-in-law, a Spaniard by the named Gonzaolo Guerrero. Guerrero, was one of two survivors of a shipwreck, years earlier in 1511 south of Jamacia. When Hernan Cortes, conqueror of Yucatan Aztecs in 1519, only two of the original Spanish shipwrecked survivors were alive: Geronimo de Aguilar and Gonzalo Guerrero. Guerrero refused to return with Cortes saying he had a Maya wife and three children, who he loved dearly. His nose and ears were pierced, and his hands and feet tattooed, according to Maya custom. When the Maya people, under the rulership of Nachancan, abandoned the city of Chetumal, it is believed that Guerrero became a military advisor to his father in law Nachancan. A conquest was made to recapture the city and take it away from the Spaniards. Gonzalo Guerrero was looked upon as "the father of the Mestizos" in this area and as the first European to adopt this land as his home and to fight in its defense. Eighteen months after they attempted to reconquer the area know today as northern Belize, the Maya forced the surviving Spanish to flee south to Omoa, Honduras. Driven out of the Chetumal/Santa Rita area, the Spaniards eventually established an outpost at Bacalar (in the Mexican state of Quintana Roo) and became successful in their attempts to conquer Norther Yucatan. The Spaniards effectively cut the ancient trade routes which Santa Rita relied upon, thus causing the Maya people to later abandon the site once again in the later part of the 1500's. The actual site of Santa Rita was originally established by Maya farmers, sometime around 1000 BC. There is evidence of this, provided in Swasey style pottery that represents some of the earliest ceramics discovered in the Maya lowlands. In the Late Preclassic period, from c 300 BC to c AD 300, it is thought, that the settlement expanded and continued to be used primarily as an agricultural site. The Classic period at Santa Rita is marked by the site's only existing structure. The building has a series of inter connected doorways and rooms with a central room containing a niche in front of which offerings appear to have been burnt. Two important burials were unearthed in this building. The first burial was discovered, was that of an elderly woman, dressed in elaborate grave goods. This burial estimated to be between the periods of the Early Classic (AD 300-600). A second burial discovered, was a large tomb, that of a warlord, who was interred with a ceremonial flint bar and a stingray spine (used in blood-letting rituals). This burial estimated was discovered possibly dating to the Late Classic period (c AD 500), Many of the artifacts found in this tomb show similarities to those from Kaminaljuyu, Guatemala and Teotihuacan in Central Mexico. The development of the Maya during this period, predominantly built low platforms surmounted by structures of perishable materials rather than the monumental masonry buildings that are typical of the Classic period. The discovery of turquoise and gold earrings, possible Aztec workmanship, copper object, and plumbate pottery (that originated in the Guatemala/El Salvador region) also attest to the expansion of long distance trade and the site's important role as a commercial centre. At the start of the 1900's, a British medical doctor, by the name of Thomas Gann (known to some as a treasure-hunter and amateur archaeologist) discovered a beautiful mural in Mixtec (Oaxacan) style at Santa Rita. Unfortunately (we do not know why), the mural was destroyed shortly after its discover, . The only record that remains of this unique piece, is some meticulous drawings done by Thomas Gann himself. Between 1979 and 1985, systematic excavations of Santa Rita were finally conducted by Diane and Arlen Chase of the Corozal Postclassic Project. Today, very little remains of the ancient site, as much of it, has been destroyed by the expansion and development of modern day Corozal Town.